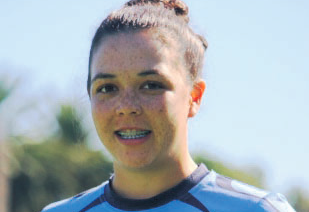 Gosford resident Ms Lauren Smith, 19, has been named in the Shooting Stars cricket team to tour Sri Lanka for three weeks. Ms Smith explained that everyone in the Shooting Stars is under 21 years of age. Ms Smith is returning to Sri Lanka after playing there for Cricket NSW in 2015. “It’s going to be a really good time away,” she said. Ms Smith has been selected after her second season of WNCL and one season of WBBL. “I’ve been working really hard for the last few years. “First year in Breakers I worked hard and heard about the big bash and was happily signed with the Sydney 6s and had a big bash season and second year of WNCL went well, got a few big wickets. “Now Shooting Stars is coming up and I’m really excited,” she said. Ms Smith explained that she’s training more and that playing in a different environment will be challenging but, “I’ve been there before so it’ll be a really good experience once again.” As a spinner, Ms Smith said: “It turns much more over there so it’s good for our spinners. “I got a 5er over there last season, so I’m really excited to go over and play on as many pitches as I can.” Once Ms Smith has returned from her tour in Sri Lanka, she will be playing in the UK in April for the Lancashire County Club. “I’m really excited to see the conditions over there and play in the cold, it will be very different, but I’m very excited to see how it goes.” Ms Smith said that she has always wanted to play in the UK and has family over there. She will return to Australia in early September and will commence the new WNCL season and WBBL 02 season. “A whole year of summer and it will never stop,” she said, “It feels like it will never stop.” “I’ll be training hard for a whole year, so I’m really excited, I love training and playing at the same time, so it will be really good.” The Shooting Stars will play their first match against England at the Sinhalese Sports Club Ground on March 27.